What IC are you using for the H-Bridge? Hey were can I buy one of these? 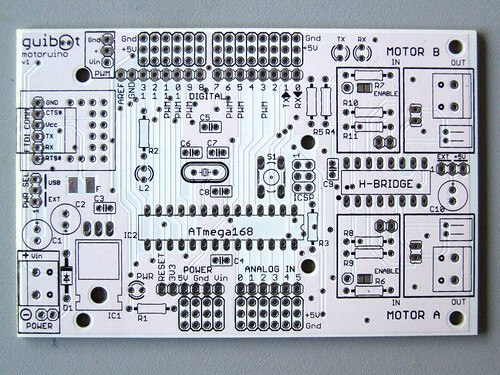 I’d like to order an assembled Motoruino board, but I can’t find the link. Are you selling them? We are working on final tweaks and improvements, within a few weeks we hope to have Motoruinos to sell. Love this. Where are you selling this? Does it comes in a kit with all the components? Really good idea! Would love to get a couple of these kits or at least the boards. Excellent choices all around, can’t wait to get one! 1) What are the extra “Gnd/+/Vin PWM” pins, next to “guibot”? 2) Extra pads and hole around R6 and R7… what for? 3) Since this would be sold w/o parts, would you consider adding a center hole between the crystal’s leads, tied to gnd, for a resonator? any news?? really looking forward to a couple. do you have an example of a v2 board to show, or even a layout example?? 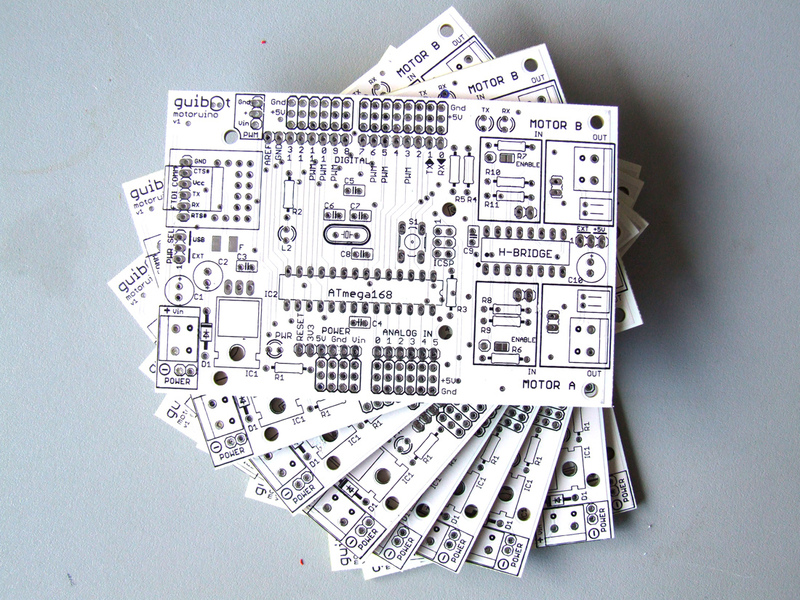 Hi guibot, are you planning on selling the pcb’s to the general public at some point? would like to get my hands on a couple of those babies. thx. Yes!! 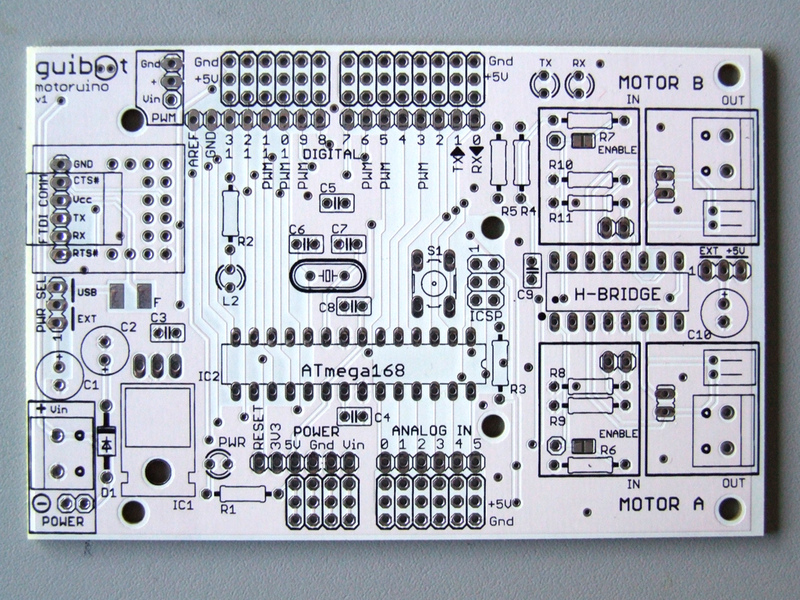 The pcb’s wil be available in mid-May. Wow, i love that implement the L293D that could make more stuff and white color is more look quit cool ! 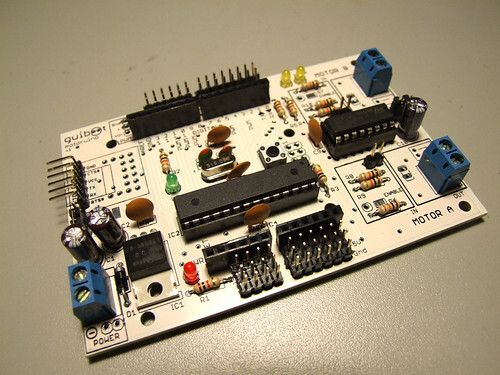 Any progress on the Motoruino boards? And how much are you selling them for? Yes, they will be available next week. Nice board. But is there a place for plugging in i2c? I guess you have thought about it. Thanks!! Analog pins 4 and 5 handle I2C. Hello, first of all, thanks for sharing. to any place. How does the GND in the board work? on your web sites are not completed. Suggestions? How big is the board itself?